There’s old adage that has often been adapted by anyone brave enough to try their hand at building an online space: You can build it, but will they come? And then there is the ancillary adage: If they come, will they stay? One of the early challenges we facilitators had with getting the Making Learning Connected Massive Open Online Collaboration up and running in grand style was finding ways to spark interest for participation by educators who might not only have little or no experience with the concepts of a MOOC but also might have very limited knowledge of the Connected Learning principles. And we wanted to do this before the MOOC was even launched. As we began planning and brainstorming about how the CLMOOC might begin to unfold, we were also cognizant of some helpful advice from one of the advisors to the project. Paul Allison, of the New York Writing Project and host of Teachers Teaching Teachers, suggested we keep in mind that the MOOC would be running in the heart of the summer, a time of much-needed respite for many educators. Keep the mood light and keep it fun, he suggested. Come on too strong with Connected Learning principles, or populate the MOOC with too much serious work right off the bat, and we would likely have a small crowd. What we wanted was massive. What we wanted was engagement. With this in mind, the facilitating team began early on with creating a series of “splash media teasers” for the MOOC that were designed to generate interest and discussions, plus word of mouth, and maybe offer an unusual form of invitation to what we were confident would be an enriching summer experience. In essence, we were engaged in a form of guerrilla marketing in educational social spaces, giving just enough information about the MOOC to intrigue folks so that when the launch became official, it would resonate with some familiarity. Facilitators also leveraged their own social capital, seeding their own followers and friends in networks with the possibilities of a summer of playful learning. The splash media teasers, which we began releasing about three weeks before the launch of the MOOC in spaces such as Twitter, Google Plus, and personal blogs, ranged from digital stories of students and teachers in the midst of making (Stephanie West-Puckett) to a video slideshow movie (Karen Fasimpauer) to a music playlist themed around connected ideas (Chad Sansing) to a glimpse of a paper airplane launched in flight (Joe Dillon) to a visually beautiful slideshow of connected images (Terry Elliott) to a remixable metaphorical stopmotion video (Christina Cantrill) to assorted comics and diagrams, and even a MOOC video game (Kevin Hodgson). In a sense, we were branding the constructivist ethos of the MOOC on the market before the product was even on the shelves. The sense that fun, creativity and collaboration would be at the heart of the experience infected all of the teasers, and gave the MOOC a certain bit of momentum very early on. The first Make Cycle established that ethos in purposeful style as myriads of participants took the concept of “make an introduction” into all sorts of unexpected directions. 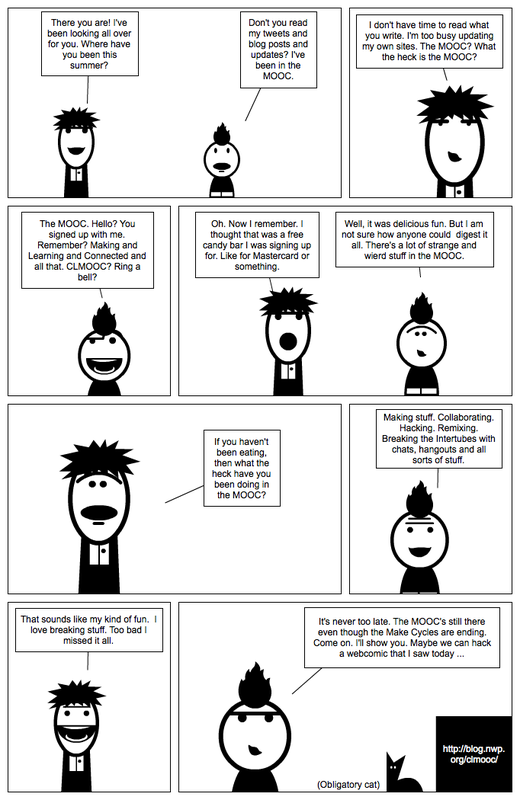 While it might be true that the playful nature of the MOOC would have been established in the first few Make Cycles, we believe the teaser campaign set the stage and raised the bar in a way that gave participants explicit and implicit permission to make their own fun, too, and to explore the Connected Learning principles and the Make Cycles on their own terms. We also benefited greatly from the National Writing Project’s leadership within the Summer of Making and Learning, which was the theme of the newly-created Innovator Educator network. 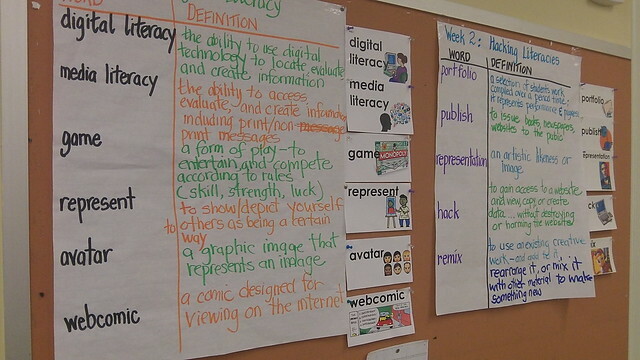 Word about the Making Learning Connected MOOC filtered through the Innovator Educator partners, and offered lines of connection from such previous projects such as the Mozilla Foundation’s Teach the Web MOOC, and the Learning Creative Learning program and the Connected Learning TV network. Even so, we had our moments of anxiety when we “opened” the doors to the MOOC and crossed our fingers that folks would come see for themselves the possibilities. To our joy and relief, come they did, and in droves, and within the first few days, the range of projects being created and reflected upon validated the promise the teasers. We were making something special … together. We still are. Anyway, along with exhibits about Nirvana and Grunge, and display areas about Science Fiction Icons, Horror movies, and Fantasy, there was an exhibit about Women Who Rock. 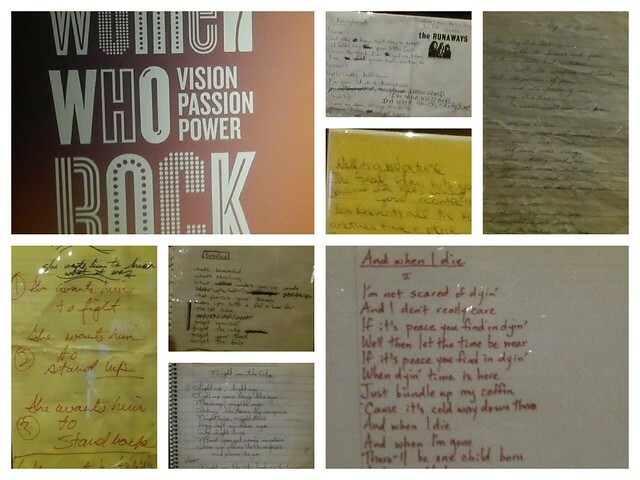 It was interesting but what I found most intriguing were the handwritten lyric sheets they had on display. I love when the layer of creativity gets pulled back and you can glimpse the mind at work. I spent a lot of time looking at the writing from Joni Mitchell, Madonna, Janet Jackson, Queen Latifah, Laura Nyro, Stevie Nicks, Joan Jett and others. Even Taylor Swift’s words were on display, which I appreciated because I hope her work in writing her own songs (as opposed to singing someone else’s songs) will inspire a generation of kids to pick up the pen and start writing. 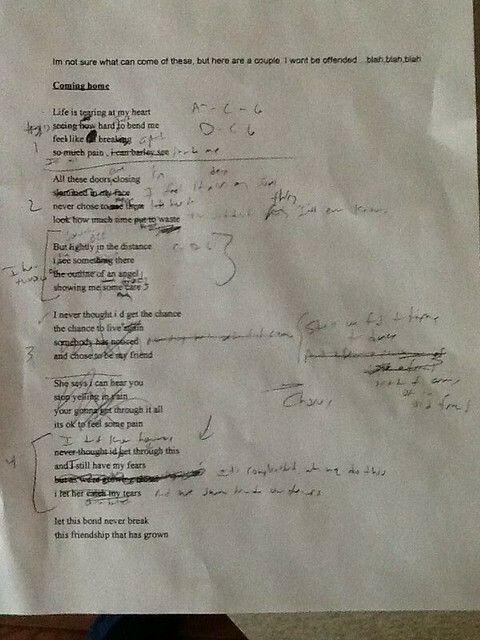 While I suspect these sheets are not all the first draft of songs (not enough scribbled out words, in my experience), there was enough there to make sense of the ideas they were going for in their songs. And even just to examine the handwriting of the artists (some neat, some messy — like me) provides an insight into the creative mind. Looking at their lyric sheets reminded me of how I look at mine when I am done writing a song, all the messy words and lines and rhythms that come and go, and how difficult it can be to make sense of it all. And then, when the finished lyrics are finally in place, you think: that’s where I was going. But the journey to that point is almost never linear and almost always messy, and I suppose one could invoke the metaphor for life here right about now. I appreciated that these artists shared out their draft lyric sheets and that no one in the museum decided it would be better to type them up for display. I enjoy the messy, and of all the areas of the museum, that was the best part for me. I spent much of my day yesterday trying to wrap my head around how to begin the collective work of not just reflecting on the wonderful Making Learning Connected MOOC experience but also how to work collaboratively with others on our facilitation team to make our learning visible. We want to leave a trail for others behind us while also looking ahead to where we go with the beautiful cacophony and spirit of the MOOC. We’re hoping to set things in motion so that others can come along and “Remix the MOOC,” as co-facilitator Stephanie West-Puckett put it so creatively yesterday. We now have an evolving plan for how we will proceed but to be honest, my brain was overwhelmed by the task here at a NWP retreat in Seattle. I kept staring for a long time at this table/chart we had created together and for some reason, my mind refused to put the pieces into place in a way that would allow me to see the big picture and all the parts. So, you know what I did? I took a cue from the MOOC itself, and went off on a Learning Walk around the hotel grounds where we are staying. Actually, I took two Learning Walks yesterday and both proved very fruitful. The first time I wandered, I tried to pay attention to the natural and unnatural surroundings of the place. I removed my head from the act of thinking about the MOOC and it was in one of those moments of forced forgetting when a flash of insight happened. I saw the whole MOOC reflection plan from a new angle — not a table but as a diagram. That may not sound like much as I write here, but for me, it was one of those writing revelations where the cogs suddenly fall into place. I went back and sketched out what had come to me on the walk, and then I showed it to co-Facililator Joe Dillon, who (luckily for me), seemed to understand what I was drawing and what I was getting at. Our discussion then made visible some other ideas that might make it easier, once all of our pieces are in place, for someone else to navigate the reflections and advice that we are compiling around our experiences of facilitating the MOOC this summer. It will provide something less hierarchical and more spread out, just like the open nature of the MOOC itself. Or so I hope. But at least I can see it now. It worked, and I was soon back inside, writing away. 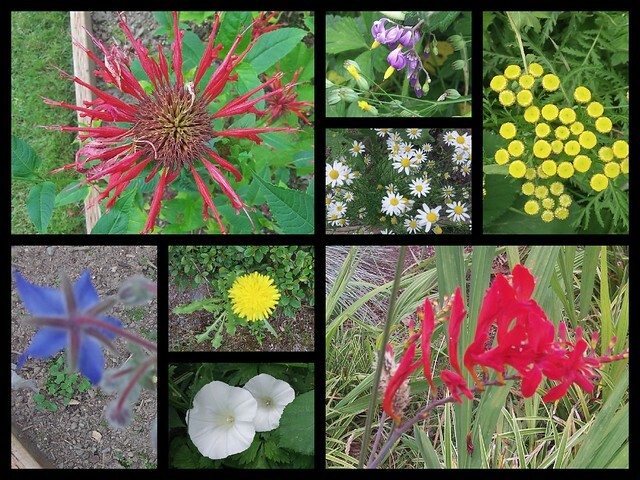 Maybe these Learning Walks were more like Diversion Walks, but I really found the act of noticing the world brought me back to noticing my writing. I gave my mind permission to figure things out. It also occurs to me as I write this post that I don’t often give my students the same opportunity. The best they can hope for is a walk to the water fountain or the bathroom, and not a walk on the grounds to observe a flower, or a falling leaf, or the slight shift in the wind before a storm. That’s a shame, but I am at a loss for how to change that right now. The MOOC has me thinking, though. We’re here at an online learning retreat with other National Writing Project groups also moving into developing online learning spaces, although I am confident in saying that the MOOC is a completely different collaborative animal than any other project represented here. And we’re lucky to be in Seattle, which has a beautiful waterfront and fish market area with Mt. Rainier rising up above the horizon like some magical mountain. It’s a stunning view. 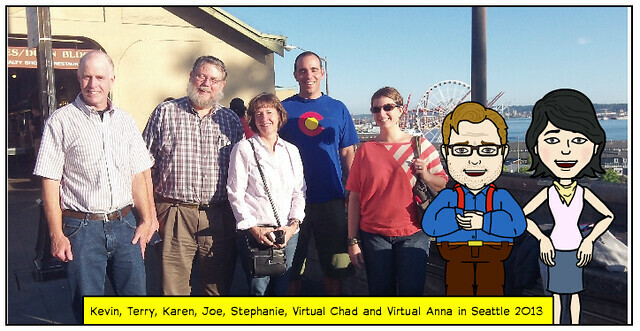 Last night, we took a group shot before dinner, but since we were missing two important companions — Chad and Anna — I added them in as webcomic avatars. I suspect they won’t mind. I’ve said it before and I’ll say it again: being part of the Making Learning Connected Massive Open Online Collaboration this summer has been a thrilling and invigorating ride. But one component that I have missed is hanging out with other folks in person. Yes, using Google Hangouts is pretty nifty. Twitter chats are a mad ride. Blogs are fun to read. Shared images give us another perspective. And the Google Plus space has become a fantastic community network of sharing and collaborating. But there’s still something to be said about being in the same room, or hanging out in the same bar, with people you know in online spaces, and this lack of more personal connections is one of the knocks against MOOCS. That lack of very personal connections that can forge something stronger than online partnerships. In this, I am lucky. Just so you know, Seattle is a long way from where I am right now on the east coast, so much of my day will be spent on airplanes, reading books and listening to music and getting impatient. And sitting. Lots of sitting, and thinking. But I suspect it will be worth it, knowing the folks who will be at the retreat – most from online interactions but also NWP colleagues I’ve know for years. 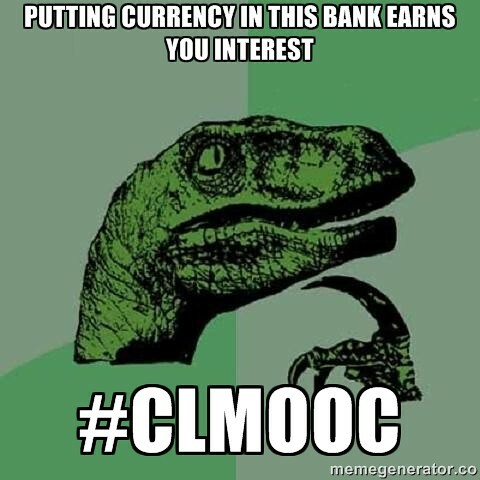 I’m pretty excited about the weekend in Seattle and I am sure we will be sharing out some of what we are doing as we go along (that’s what we do with the #clmooc, right? Share, reflect, connect, repeat). Wish you were there, too. (Or maybe you will be. If so, see you tonight). 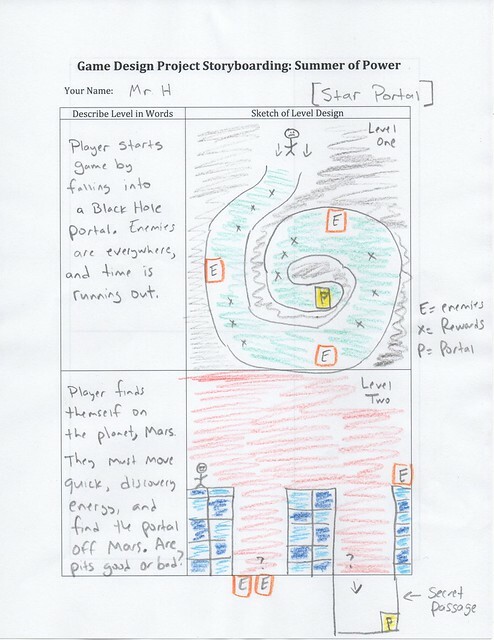 One of the first activities I have students do in Gamestar Mechanic as we move into video game design is to “hack” a traditional video game and make it their own. 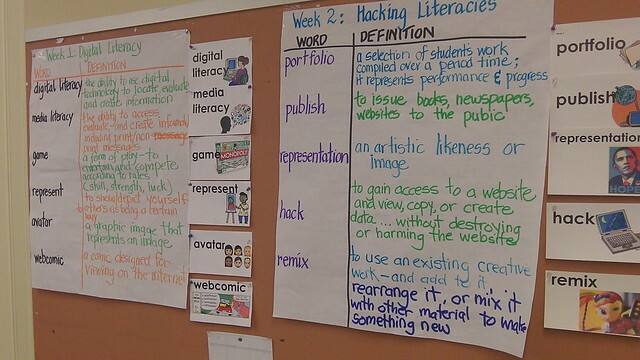 This all ties into some of the earlier work in our digital literacies workshop for high school students about the hacking and remixing culture. 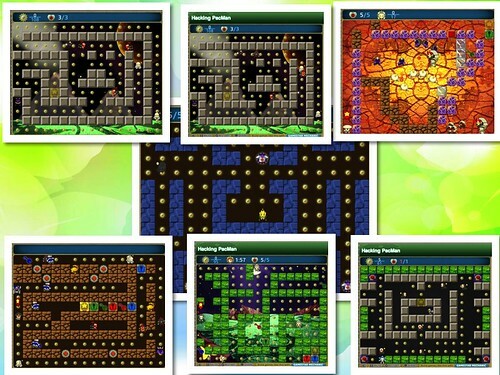 This summer, the task was to Hack PacMan, which grounded a lot of our discussions around topics such as top-down versus platformer; the use of backgrounds and colored blocks; the levels of complexity between an impossible game and an easy game; and more. 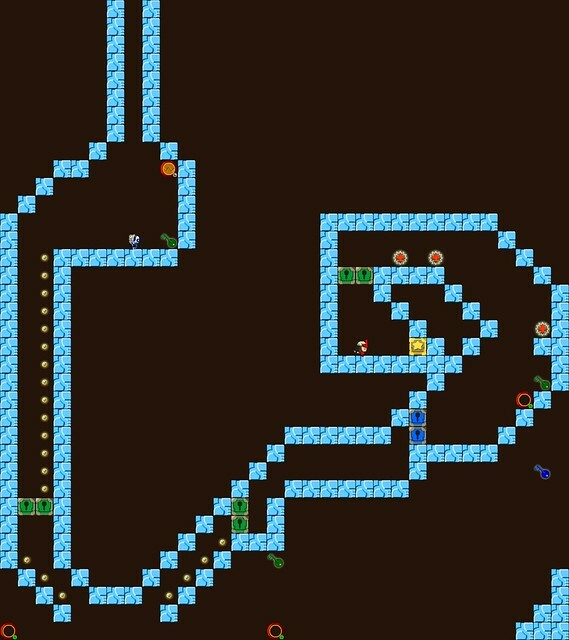 The simplicity of the classic game itself — basically a one-screen maze with a task and enemies — allows an entry point for just about everyone, from seasoned game veterans to newbies. It’s interesting to see where they take the concept of Pacman, too, as some try to replicate the original and others barely acknowledge PacMan in their game. Want to try one of the games out? There are many things that I love about the Making Learning Connected MOOC, but one of the best ideas — which will become a sort of legacy of the MOOC, in my opinion — is the concept of the Make Bank. Here, folks have been sharing information about the projects they have been making in the MOOC, giving quick tutorials on how to replicate the projects. As we think about the school year ahead, what I wonder is: how could one replicate this in the classroom? It would surely connect to expository writing and publishing to the world. (By the way, I give credit to Karen F. for the concept of the Make Bank, and she would no doubt give a hat tip to the folks at ds 106 for the way they gather ideas from participants of that project and share. And Terry E. helped considerably with the technical aspects of setting up the Make Bank via WordPress.). Do you have a make to add to the bank? Please do.